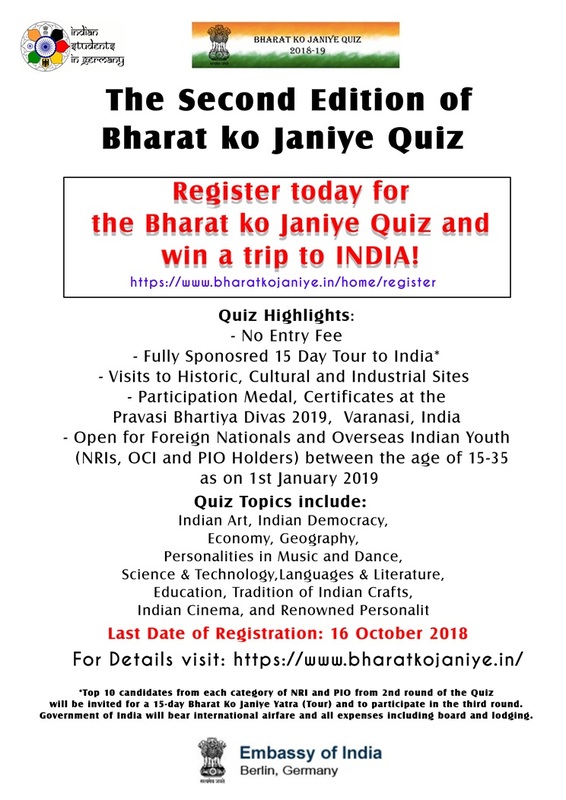 The Ministry of External Affairs is organizing the second edition of Bharat Ko Janiye (Know India) quiz, open to young overseas Indian youth (i.e. PIO and NRIs) between the ages of 18-35 years. The quiz participation is also open to Foreign Nationals. Indian Art, Indian Democracy, Economy, Geography, Personalities in Music and Dance, Science & Technology, Languages & Literature, Education, Tradition of Indian Crafts, Indian Cinema, and Renowned Personalities. So HURRY UP AND REGISTER NOW! Grab your CHANCE to win a FREE TRIP TO INDIA! *Top 10 candidates from each category of NRI and PIO from 2nd round of the Quiz will be invited for a 15-day Bharat Ko Janiye Yatra (Tour) and to participate in the third round. Government of India will bear international airfare and all expenses including board and lodging. We look forward to seeing you all as participants of the quiz.